The Incognito mode of Google Chrome browser allows you to browse the Internet without leaving any tracing of your browsing history on the computer – none of URLs you visited are recorded, cookies and cache are deleted once the browser is closed. 5) Click on OK to save the changes. Yes it works but keeps resetting back to the ordinary Chrome. Any ideas why? Great. Solved my issue with cookies not being cleared after exiting Chrome. Thank you. Quick, easy, done! I Can not get it to work one dash – 2 dashes . Only opens in regular crome? 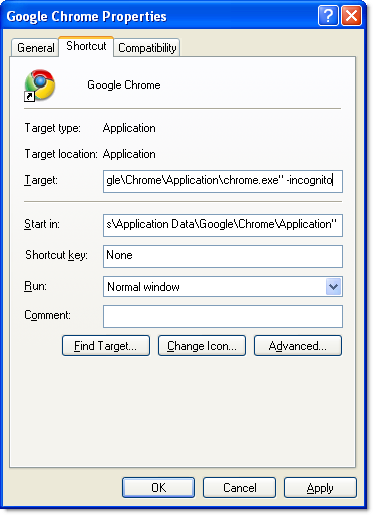 How pin to W7 taskbar Chrome and Chrome Incognito? I would like to follow your instructions but for I cannot find a way to create an alternate shortcut on the desktop. Nor can I find a ‘START’ menu on this MacBook Pro. With Vista there is no quotes on the shortcut and the -incognito would not work. I tried adding quotes and then following this tip, but it still didn’t work until I added 2 dashes like this –incognito. Great tips! Finally can have separate icons on the desktop, much easier to access multiple Gmail lol. Thanks for the trick. 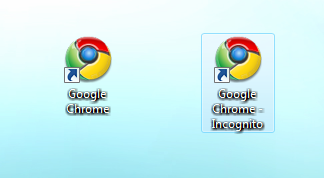 I created an icon for the incognito shortcut that is a copy if the man in the upper left corner of Chrome. If you want, I can sent it to you so you can post it here, just let me know. You should update the blog post and screenshot to show that -incognito belongs *after* the end quote. Most people won’t bother to read the comments and just think your tip is wrong. Thanks though, after reading the comments I was able to get it to work. Thanks Sarah. The post is updated now. Great Tip and follow ups, Thanks! it works with a single dash/hyphen. That’s not the issue. couldn’t get it to work. Problem with shortcut message pops up stating that the target name is not valid. Superb tip. I’ve seen other ways of doing it, but this is clearly the “real way”.